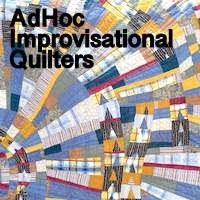 One of my motivations for starting this blog was to connect with other quilters, since they are thin on the ground round here. The Bloggers Quilt Festival, run by Amy at Amy's Creative Side, is a great opportunity to share what you have been working on and to see what other people have been up to. There are already some great quilts on show and there will be more to come over this week. This is the first time I have entered a quilt (on account of how I haven't had a blog before! ), and I'm really happy to be participating. This is a quilt I made for my daughter this year. Working name was Annie's quilt, but we wanted a posh name as well, so it's Fine Feathers. She's been waiting a while, but finally it was her turn. She loved the Michael Miller Wing Song fabric so that was my starting point and it grew into a sort of medallion with a big piece of that at the centre. I played around a lot with wonky stars (the first time I had used them) as well as little log cabin blogs and blunt-nosed triangles. It was a lot of fun. The back was a few, very few, scraps left from the front, plus some pretty French General fabrics and other bits from stash. Quilt is about 70"x85", machine pieced and hand quilted using perle cotton. The wadding is Hobbs Heirloom wool. I am entering this in the Original Design category. If you haven't already visited do go and have a look. Linking up to Stitch by Stitch for Anything Goes Monday. I don't quite know what drew me to the quilt, but it is just how everything works together I think. The other being I love turquoise in quilts. Happy Quilting! I like the big pieces mixed in with the smaller wonky blocks (looks like some Gwenny influence there?). And the Medallion layout with all the different borders and colors! Great job! I love the colors and variety of blocks used!! I especially love the wonky blocks...they add a little bit of fun! What a big and beautiful quilt! Love the mix of colors and fabrics and shapes! Love the color combination and fabrics you used!